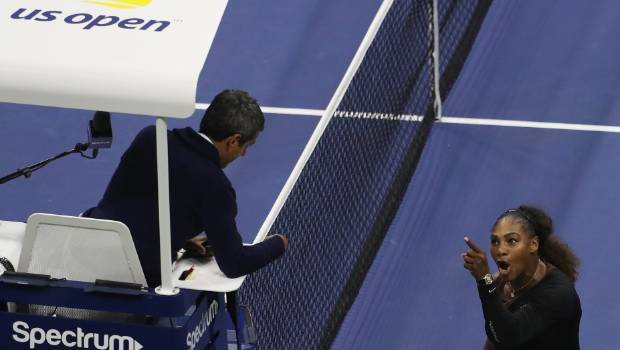 To me that’s crazy; the umpire gave a legitimate warning for coaching and she then harangued him at every changeover thereafter, stabbing her finger at him: “apologise”, “you owe me an apology”, “announce to the crowd that I didn’t cheat” (the umpire didn’t say she had cheated – he said she had received coaching, which the coach later admitted to and for which many players receive warnings since that is the rule), “you’ll never be on my court again” (yes, that’s “my court”) becoming more and more hysterical (yes, Billie-Jean King, I said hysterical, like McEnroe was hysterical – see, a man can be also). The tirade continued at every changeover after the penalty, becoming more heated each time. She was clearly not going to let it go and it was bound to end in tears. She then she called him a “liar and a thief” in front of 20,000 people and a TV audience of millions and expected to get away with it. “He stole a point from me”. How did she figure that one out? She smashed her racket which is always an automatic point loss after an initial code violation. Serena Williams comforts US Open winner Naomi Osaka of Japan. Her behaviour was the female equivalent of John McEnroe and remember when he was disqualified from the Australian Open back in 1990 for a similarly abusive tirade? No sexism there. The umpire did the only thing possible and she went completely crazy. She stole Naomi Osaka’s glory as she so frequently does from opponents who start beating her. It’s highly unlikely she would have behaved like that had she been in a commanding position. 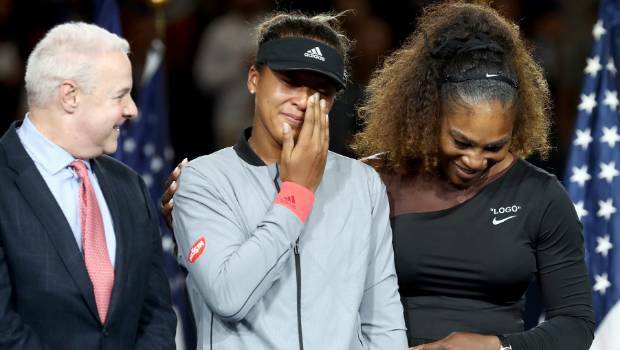 Naomi Osaka of Japan and Serena Williams of the United States after a controversial women’s US Open final. And then she skewed the whole incident, made it all about sexism. No Serena, you are obfuscating the whole issue and, sadly, a lot of people are falling for it. A week later – in her first interview since the controversy on Australian TV show The Sunday Project – the 23-time grand slam champion still didn’t back down. 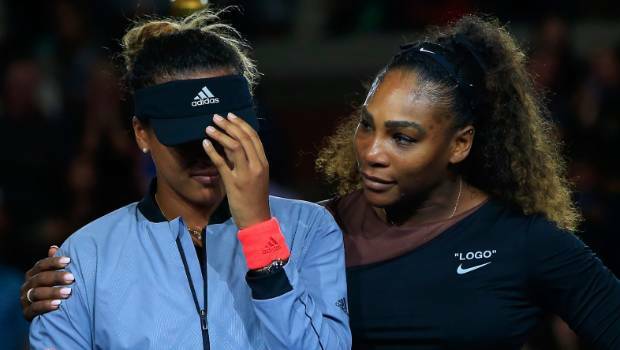 “I just don’t understand … if you’re a female you should be able to do even half of what a guy can do,” Williams said in her latest interview which echoed her feelings after the match. 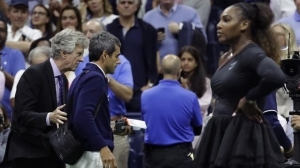 Serena Williams roasts umpire Carlos Ramos, and more than a week later still claims he was sexist. But this is the third time that she has behaved in this way at the same event. Remember her “I swear to God I’ll f….ing take the ball and shove it down your f….ing throat” at the linesman for calling her for a foot-fault against Kim Clijsters during the 2009 semi-final? And then there was a similarly abusive incident against Australian Sam Stosur in the finals in 2011 when she screamed “come on” before the point had even ended and went crazy when the point went against her. And fans call her a great role model. Nice role-model eh? Williams received the paltry fine of US$17,000 (considering her runner’s up prize money of US$1.85 million) for her behaviour. She should be banned for at least six months. It may make her think twice in future. And spare a thought for the poor umpire Carlos Ramos who had to be escorted off the court by security and was prevented from receiving his umpire’s medal at the prize ceremony. I expect he has had death threats on Twitter. By the way, his earnings for umpiring the match, in what I viewed as a thoroughly professional manner, were US$600. Katrina Allen is a former tennis champion and a world no 1 at Royal Tennis, the original form of the game.